white light into white wire. no matter how straight it is. we can’t step into twice. Uche Nduka was born in Nigeria to a Christian family. Raised bilingual in Igbo and English, he earned his BA from the University of Nigeria and his MFA from Long Island University, Brooklyn. He left Nigeria in 1994 and settled in Germany after winning a fellowship from the Goethe Institute. He lived in Germany and Holland for the next decade and immigrated to the United States in 2007. 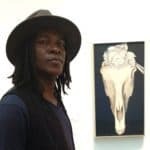 Nduka is the author of numerous collections of poetry and prose, including Nine East (2013), Ijele (2012), and eel on reef (2007), all of which were published after he arrived in the United States. Earlier collections include Heart’s Field (2005); If Only the Night (2002); Chiaroscuro (1997), which won the Association of Nigerian Authors Poetry Prize; The Bremen Poems (1995); Second Act (1994); and Flower Child (1988). Belltime Letters (2000) is a collection of prose.